Common Name: Santa Catalina prairie clover Duration: Perennial Nativity: Native Lifeform: Subshrub General: Small shrub, mostly erect with thin, gray branches, often abundantly pubescent. Leaves: Pinnate with 5-7 leaflets, these covered with long, somewhat stiff hairs that are silky gray. 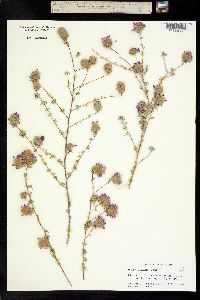 Flowers: Flowers crowded in a dense spike, the cream banners and purple keels protruding from the densely strigose cluster of calyx tubes, these 1-1.5 cm, giving the appearance of a furry ball when short or a spike when long, bracts linear-lanceolate, densely hairy on margins and backs. Fruits: Small, pubescent to strigose, indehiscent pod. 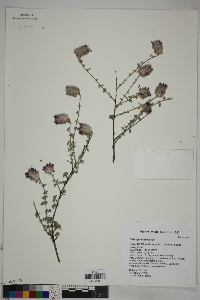 Ecology: Found on gravelly or rocky hills and slopes from 2,500-5,000 ft (762-1524 m); flowers February-May. Distribution: Ranges from southern Arizona south into Mexico to southern Sonora and east and south to San Luis Potosi. 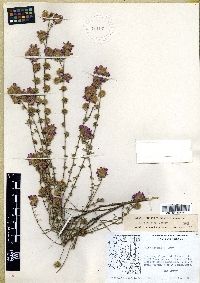 Notes: Similar to D. formosa and D. versicolor var. sessilis, but differs in having 5-7 leaflets that are cuneate obovate and covered in short appressed hairs that are shiny and appearing silky. 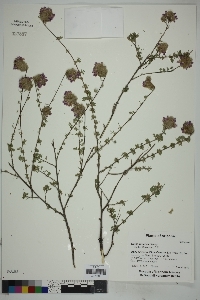 Ethnobotany: Unknown Synonyms: None Editor: LCrumbacher and Steve Buckley, 2011 Etymology: Dalea is named for Samuel Dale (1659-1739) an English botanist, pulchra refers to "pretty".